Luke George Goss Sr. (189837) father to Luke George Goss Jr. (880610) and William Henry Goss (880838). Father to Luke George Goss Jr. (880610 ) and William Henry Goss (880838). Private Luke George Goss transferred from the 91st to the 186th Battalion, going overseas March 28th, 1917. After training at Bramshott Camp he proceeded to France September 8th,1917, drafted to the 18th Battalion as a stretcher bearer. 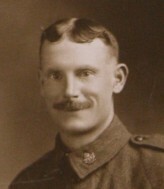 He served until February 17th, 1918, when returned to England with a severe attack of trench fever and admitted to No.3 General Hospital, Newport, Monmouthshire, after convalescence at Bearwood, Wokingham, Surrey, he served as orderly at the C.C.D., 3rd Canadian Reserve Battalion, Witley, until sent to Canada for discharge December 8th, 1918, arriving at Halifax December 14th. Private Luke George Goss received his honourable discharge January 13th, 1919, being medically unfit for further military service.